The grave marker for Famiglia Genetti Lanci in Castelfondo’s San Nicolo cemetery. During my visit to Castelfondo, Italy in 2011, I had the good fortune to meet a distinguished gentleman by the name of Andrea Cologna. Born in the village, Andrea had left as a young man, living most of his adult life in Canada. He had recently returned to his childhood home of Castelfondo. Luckily Andrea was fluent in English, Italian and the local dialect of Nones. He was the perfect guide, telling me stories of the old days, explaining important village landmarks and helping me walk in the footsteps of my ancestors. When we visited the small cemetery next to San Nicolo church, there were many surnames I recognized … of course among them, many Genettis. Andre brought me to a very specific part of the cemetery and pointed to several grave markers. “These are your family, the Lanci. The other Genettis aren’t from your branch. Damiano (my great-grandfather) was a Lanci,” Andrea said. I was mystified, what was a “Lanci”? I had never heard this name before. 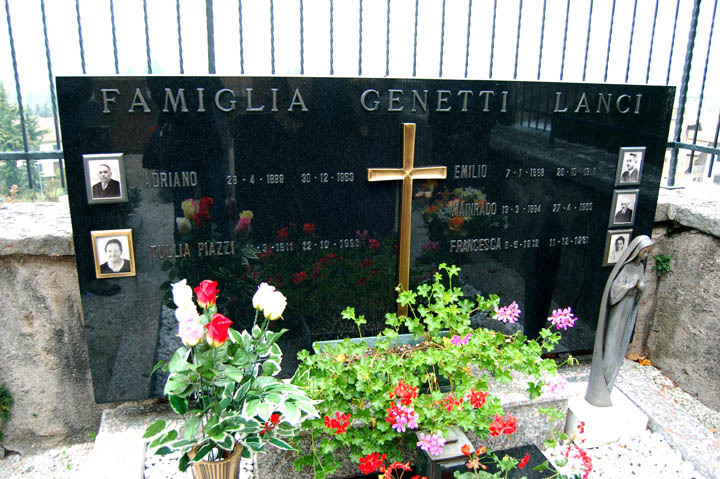 So I took a few photos of the stones that read “Famiglia Genetti Lanci” and decided to look into this odd name later. About six months after my trip, I began researching the old church documents. And there it was again! The name “Lanci” was attached to Genetti in most birth, marriage and death records of my branch of the family, but not to other branches. It appeared in different forms such as Lanchet, Lancia and Lanci. Andrea wrote that he had done a little research on his own and found that the original form of the name was “Lanchet” which was Old German for the word “Lance”. After a bit more research into Trentino history, I soon learned this “second name” was commonly used by large Tyrolean families to designate different sections of the family. It was called a sopranome or nickname. The sopranome had several purposes. It helped delineate close blood relatives so you didn’t accidentally marry your cousin, which could happen in a small, isolated community. It also identified a specific person. At any one time there could be five or six men named Giovanni Battista Genetti living within the village, as children were often named after parents, grandparents or other relatives. By adding the sopranome to the surname, one could tell the difference between Giovanni Battista Genetti Lanci and Giovanni Battista Genetti di Raina. Besides Genetti Lanci, I also found Genetti Onz, Genetti di Ovena (of Ovena) and Genetti di Raina (of Raina). These seemed to signify the main branches of the Genetti family tree. 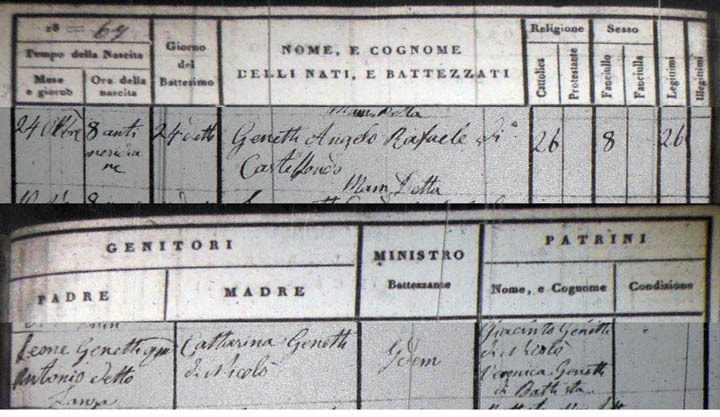 Closely examining each generation in the ancient ledgers, I discovered the first ancestors in my direct line to have Lanci documented in a birth record was Pietro Genetti born in 1650. Most likely his father, Georgio Genetti (born 1623) had begun using it during his lifetime and passed it on to his children. And so this sopranome continued through at least eight generations, but was not used by the families that emigrated to the Americas. When my great-grandfather returned to Castelfondo to live out his later years, he was known in the village as Dominic Lanci. With the passing of three generations, the tradition of the sopranome has faded from our memories. What a shame! I rather like the idea that my Italian name could have been “Aloisia Anna Genetti Lanci”. I’ve been corresponding recently with Chiara Dalle Nogare, one of our Italian cousins. She is on holiday right now with her mother, and three aunts (the Genetti sisters) in Castelfondo. Chiara sent some very interesting news from the village that I wanted to share with you. It completely warmed my heart to see such acceptance and empathy by the people of Castelfondo for refugees that had lost everything. Thank you Chiara for sending us this news! Who will tell your story when you’re gone? To celebrate Domenica (Sunday), here is a little story from my childhood that might make you smile. 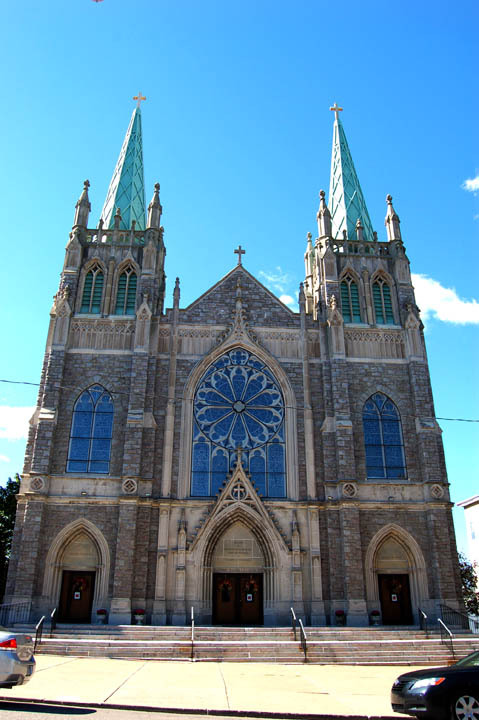 I was born in Hazleton, Pennsylvania and lived there until I was six years old. Every Sunday I went to church with my father at Saint Gabriel’s. My Nonno and Nonna belonged to this church too. And much later in my life, I found out my great-grandmother Oliva Genetti had also worshiped here for years. From the perspective of a small child, this was a HUGE church. I was in awe of the sights and sounds around me as we walked up the long, long center aisle to our pew every Sunday morning. We always sat in the same place on the left side of the church. Being only a few feet tall, I was never able to see the front altar. The people who sat in the pews in front of us, towered over me blocking my view. The only thing that I could really see were large speakers mounted on the walls high above everyone’s head. Now being only a child (and one with a very active imagination) I didn’t yet understand the concept of church. My father told me we went there to talk to God and I believed him. When we sat or knelt in our pew I would hear the voice of a man coming through the speakers. The people around me answered him. Usually he was speaking in a strange and beautiful language (for at that time the mass was still spoken in Latin). Because I was too short to see a priest or even understand that there was an actual man somewhere in the front of the church, I reasoned that it must be God talking to me. And he was speaking a magical language! Are you chuckling yet? In my mind this made St. Gabriel’s a very special place … a place where I could have a conversation with God and he would answer! 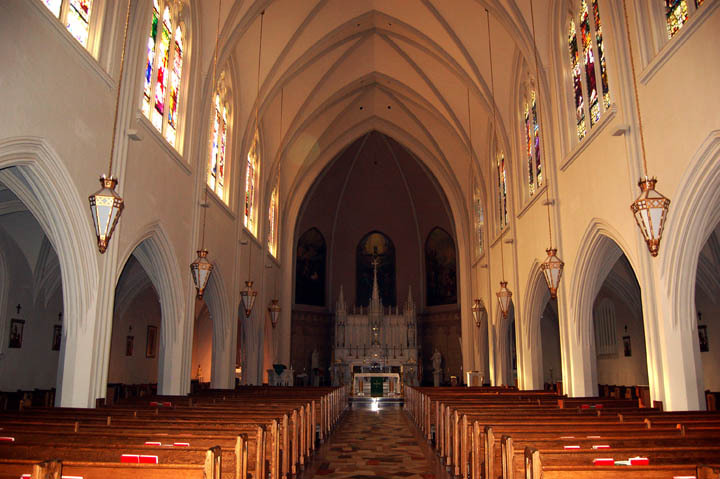 When I was about six years old we moved away and my father took us to a much smaller church. It was then that I discovered there was an altar in the front with a man dressed in robes who did all of the talking. Although I’m no longer a practicing Catholic, I still make it a point to visit Catholic churches when I travel. I might light a candle and sit quietly for a few moments … and listen for the voice of my childhood God. If you look deeply into the palm of your hand, you will see your parents and all generations of your ancestors. All of them are alive in this moment. Each is present in your body. 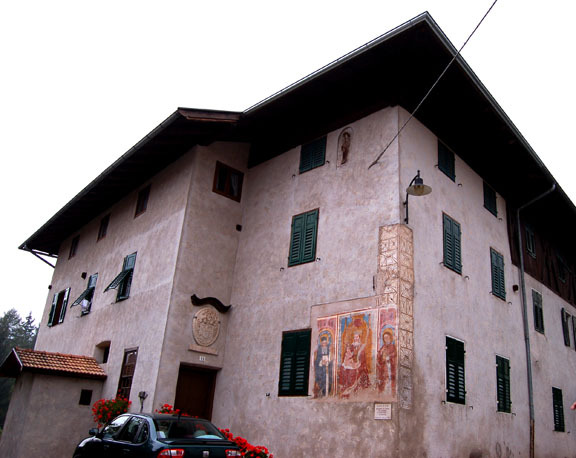 The original Genetti homestead in Castelfondo, Italy. Ciao alla mia famiglia in Italia! Sending a big hello out to our Italian cousins especially those from Castelfondo. Word about the website has reached the Genettis of Trentino – how wonderful! August is a time of holiday in Italy (vacation to us Americans) and many family return to Castelfondo to enjoy the coolness of the mountains. Perhaps our little genealogy website will be shared with distant family during this August holiday. It is truly a small world when we can connect and share our ancestry with cousins in different countries. Cari cugini Italiani – please feel free to send us your stories and photos to post on this website. Your American cousins would so appreciate the opportunity to learn of your life and ancestry in Trentino. Mille grazie! The Genetti Family Tree contains over 1,000 people (with many more to be added). It begins in the 15th century and represents about 18 generations. You’re probably wondering how the heck did I find all of those vital statistics such as birth, marriage and death records, especially for people who lived hundreds of years ago. Well here’s the story. From the perspective of genealogy research, the Genetti Family is quite lucky. We know the exact village where the family first took root, the church where their records were kept, how long they lived there and when they left. The Genettis also kept a record stretching back to the 1500’s of male ancestors, their birth dates, their wives and the date of their marriage. This information was passed down through the generations. The fact that the family lived in exactly the same location for hundreds of years, plus their penchant for record keeping is almost unheard of in the realm of genealogy. It makes the task of researching so much easier. For our modern relatives born in the United States, we have census records, immigration records, state birth and marriage records, the Social Security Death Index, land grant and ownership records, military records, cemetery indexes and newspaper records such as obituaries. All of these stats are easily found online, are part of public record, and in English. By compiling this information, we can build a fairly accurate picture of a person’s life in the United States. However, our ancestors from Castelfondo posed a much more interesting challenge. Armed with a modern version of our family tree, I reasoned that most of these people must have been born, married and died in Castelfondo. Therefore, they would likely all be listed in the parish church registries. Next I went to FamilySearch.org (maintained by The Church of Jesus Christ of Latter-Day Saints who supposedly have the world’s largest genealogy data bases) and checked their catalog. Yes, Castelfondo church records were available on microfilm. I ordered the films and had them sent to my local Family History Center. At the center I could access the information to my heart’s content. One day in 2012, I sat down to view my first microfilm. That’s when the fun began. The records start in 1567 and continued through 1925. I believe many generations came before this time, but the church was not required to keep official records until the mid-1500’s. The registries also contained a few gaps here and there, but for the most part the records appeared complete. However, the registries were all hand-written (since there were no typewriters or computers in the 1500’s) and not always very neatly done depending on the scribe at that time (usually the parish priest). Also the records were written in a variety of languages … none of which I understood! Early records (1563 to the mid-1600’s) were in the regional dialect of Nones (an ancient language spoken only in the Val di Non region, considered a Gallo-Romance language). Records from mid 17th century to about the 1820’s were in Latin, with some Italian and a bit of German. Later records beginning in 1824 are all in Italian and neatly transcribed into registries with pre-printed headings and columns. Luckily most information contained in baptismal, marriage and death (morti) registries is basically the same. So with the help of online translators and by comparing older records with later ones that I could easily translate, I was able to decipher the information. Over a period of a year, I visited the Family History Center every Tuesday and spent about six hours on each visit, searching through registries for Genetti ancestors and translating records. Finally I decided to photograph all of the records from the microfilm (several hundred pages!). Now I have San Nicolo’s records from 1567 to 1923 on my computer, and easily accessible for further research. So for your pleasure, here are three baptismal records from different time periods along with my translations. All three people also reside on our family tree. I’m sure there will be many questions concerning the information contained in these documents … but that will have to wait for another blog post. I hope to have many more vital statistic records available to you in the future. Andrea Genet, baptized 11 Jan 1568. Peder (Pietro) Genet of Melango is his father, no mother is recorded. His godparents are: Zoan Segna and Battista (unknown name?) wife of the late Antoni Lorenceto of Melango. Petrus (Pietro), baptised 25 June 1650, the legitimate son of Georgeii (Georgio) and Lucia who are married with the name Geneti di Lanci. The child was baptized and his godparents are: Joanne (Giovanni) Batista (Baptista) (unable to translate surname) and Anna daughter of Andrea Geneti di Lanci. Born on the 24th of October, 1867 at 8:00 in the morning. Baptized on the 24th of October. Baptismal name: Angelo Rafaele Genetti of Castelfondo. He was the 26th Catholic child to be born that year and the 8th boy child. He was also of legitimate birth. The person who delivered him was Maria Detta. His father was Leone Genetti, son of the late Antonio of (Genetti) Lancia (this is the sopranome or nickname for our branch of the family). His mother was Catterina Genetti, daughter of Nicolo (Genetti) (Catterina and Leone were actually distant cousins). It says who the priest was that baptized Raffaele but I can’t make this out. His godparents were Giacinto Genetti, son of Nicolo (Genetti) and Veronica Genetti, daughter of Battista (I believe Veronica was also Raffaele’s grandmother). For more info about the Ladin language of Northern Italy and the Nones dialect of the Val di Non, click here. Since launching our site less than a week ago, I’ve heard from many Genettis living in the USA, Italy and even someone from Argentina! Let’s keep the momentum going. Please help share our ancestry and culture with other family members. Take a moment and email our website to your sisters, brothers and cousins. Or “like” and share us on FaceBook. Our web address is: www.genettifamily.com. On FaceBook you can find us at: www.facebook.com/genettifamilygenealogy. 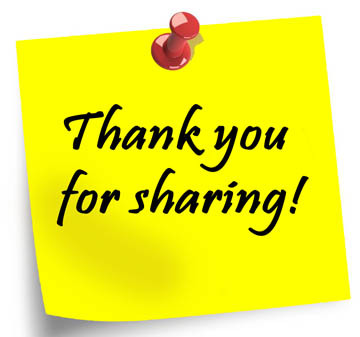 Thank you – Mille Grazie! I bet you didn’t know there are Genetti Family in South America. Yep! When Tyroleans began to emigrate, they moved to both North and South America. Today, several generations later, there are Genettis who speak Spanish and have Spanish names. 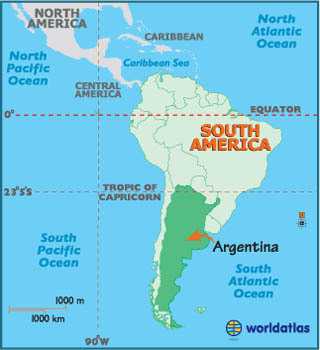 Last night I received an email hello from Argentina! A big shout out to our family living south of the equator! We would love to add you to our ever-growing family tree. I had a great question sent to me today by a family member. Why can’t we see the information of living people when viewing the online family tree? Since this family wanted to update information on their immediate family members it was difficult to know exactly what names, birth dates, etc. were correct when all that can be seen on the tree is a placeholder that says “Living”. To protect living descendants from those nasty people prowling the internet looking for personal data they may use to perpetrate identity theft, it is HIGHLY advised never to publish a living person’s information. This is the same policy used by all genealogy sites to protect their users. If you are a family member and would like to check family vital stats such as birth dates, marriages, children, divorces, etc. for living descendants, please email me directly. I can provide you with a Descendant’s Report in PDF format for several generations of your family that includes vital stats info. In order to receive this report you must be a member of that particular family and I must be able to identify you in my data base. No Descendant’s Report will be sent out unless this criteria is met. Thank you for sending this question. I’m sure many family members out there were wondering the same thing. Have questions? Send them to info.genetti.family(at)gmail.com.